Trump’s revenge: Break up the 9th Circuit Court!? 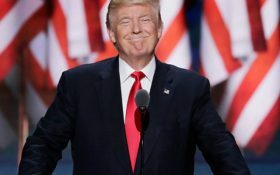 Democrats are celebrating a victory over President Donald Trump after the 9th Circuit Court of Appeals ruled unanimously to uphold a lower court ruling suspending the president’s travel ban’s enforcement. But it’s Trump that could get the last laugh. There’s an effort by conservative lawmakers — led by a vocal Trump rival — to permanently break apart the liberal court. It’s been in the works for over a month… and it’s led by Arizona Sen. John McCain. No one familiar with the 9th Circuit Court of Appeals should be surprised at today’s ruling. The 9th Circuit has a well-earned reputation for being presumptively reversible,” South Carolina Rep. Trey Gowdy said. According to The Daily Caller, over 80% of the appeal court’s rulings have been overturned when challenged in front of the Supreme Court. Covering a huge swath of territory — nine western states plus Guam — the San Francisco-based court handles far more cases than any other federal appeals court, including some rulings that have invoked furor from conservatives over the years. Among them: finding that the phrase “under God” in the Pledge of Allegiance is unconstitutional and ruling that states can force Christian pharmacies to sell abortion pills. This isn’t the only such bill aimed to take down the “nutty” 9th, either.